One common question that first-time builders and gamers have when they are choosing their memory is whether or not they should get a single stick of RAM or two sticks of RAM that equal the same capacity as the single stick. Most people will say that it is better to get two sticks of RAM so that you can utilize the “advantages” of dual channel memory. But is that true? What about in gaming? And, how big is the performance difference? What about quad channel configurations? We’ve benchmarked a handful of games in dual and single memory configurations and in this article, we’re going to answer those questions so that you have a better idea on whether or not you configure your RAM in single or dual channel memory. What Does Quad, Dual, and Single Channel Even Mean? Essentially, if you run one stick of RAM in your computer, it will be running in a single channel configuration. If you run two sticks of RAM, they will be running in dual channel configuration. And, if you run four sticks of memory, they could be running in quad channel configuration, depending on whether or not you have a CPU/motherboard combination that supports quad channel memory. You can run three sticks of memory, but there aren’t a lot of motherboards that use triple channel configurations. So, in most cases, installing three sticks of RAM would be utilizing two of the sticks in dual channel mode and one of the sticks in single channel mode. The advantages of running two or four lower capacity memory sticks in dual or quad channel configuration (again, not all CPU/motherboards support quad channel memory) is that they will provide the same capacity as a larger single stick of memory, while at the same time doubling and quadrupling the amount of memory bandwidth that is available. When you add the second (and fourth) stick of RAM, you are adding a parallel channel that can be accessed simultaneously with the first stick of RAM. The common conception is that by doubling or quadrupling the available memory bandwidth, dual and quad channel configurations will make your system perform better. Single Channel vs Dual Channel Memory: Not That Big of a Difference for Gamers? We took two kits of DDR4 3200MHz RAM and tested them in pretty much every common memory configuration available. One of the kits was a 4x4GB kit and the other was a 4x8GB kit. 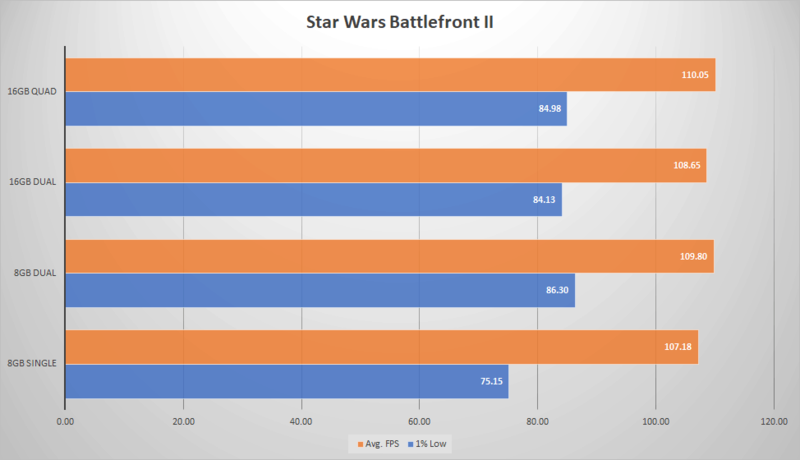 We benchmarked these different configurations in five different games: Dirt 4, PUBG, Middle Earth: Shadow of War, GTA V, and Battlefront II. Our test system used an i7-8700K, a GTX 1070, and a 1920×1200 monitor. *NOTE: In our test, we originally made the error of thinking that we were running our 4x8GB configuration in quad-channel configuration. However, as pointed out by Xenotester in the comment section, the Intel Core i7-8700K does not support quad-channel memory, but, rather, is limited to dual channel configurations. Because of this, the results below do not portray an accurate view of the difference between quad-channel and dual-channel memory performance in gaming. So, when looking at these benchmarks, the only real takeaway comes from A) the single channel vs. dual channel performance, and B) the difference between running four sticks of RAM in dual channel and running two sticks of RAM that equal the same capacity in dual channel. Across all five games, there was no significant difference between how single and dual channel memory performed. Again, we errored in our belief that running four sticks of RAM on a Z370 motherboard would be utilizing a quad channel configuration. So, the 16GB quad vs 16GB dual results shouldn’t mean anything other than that running four sticks of 4GB of RAM in dual channel configuration didn’t really offer any performance boost over running two sticks of 8GB of RAM in dual channel configuration and vice versa. The only metric that really varied that isn’t shown in this graph, is that on the single channel memory configuration, the CPU usage was anywhere from 10-25% higher than on the dual channel configurations. So, I think what happens is that in dual and quad channel configurations, the extra available memory bus takes a bit of the workload off of the CPU. I could be wrong about that, but at first glance, that seems to be what is happening. So, you could theorize that with a budget-friendly processor, there is the potential for a noticeable performance drop in single channel versus dual or quad channel configurations, but even then, my guess would be that it would also be minimal. While I’ll admit that my test methodology wasn’t the strictest and perhaps it would make more sense to run the same tests with a more budget-oriented gaming PC, I think in the grand scheme of things this points to the fact that dual channel configurations don’t offer that significant of a difference over single channel configurations—at least in gaming performance. So, Should I Just Stick to Single Channel Memory Then? The tests above show that, for gaming, there isn’t any kind of noticeable difference between running your memory in single and dual channel memory configurations. In some cases, especially during sales, you may be able to find a dual kit of RAM for less expensive than a single stick of RAM. Typically, single sticks of RAM are less expensive than dual kits. However, in the world of PC hardware, there are hundreds of sales every day on the various components from the multitudes of brands and manufacturers. So, if you can grab a dual kit of RAM for less money than a single stick of RAM (all other factors equal), then do it. The other reason to choose a dual or quad kit over a single stick of RAM is for aesthetic purposes. A single stick of RAM on a motherboard with four DIMM slots won’t look as clean as if you were to use two sticks of RAM—or, better yet, four sticks of RAM. So, if the price difference between a single stick of RAM and a dual kit (or quad kit) of the same capacity is minimal and you are taking the aesthetics of your build into consideration, then you might want to try and fill up your DIMM slots. 3. Dual Channel Beats Single Channel in Professional Applications? This is a test for another day, but of the benchmarks I’ve seen where single channel memory is stacked up against dual channel memory configurations in professional applications (editing, design, CPU-laden tasks, etc. ), there is a bit more of a difference in performance between the channel configurations. So, if you will be using your computer for any of those kinds of tasks, going with a multi-channel memory configuration might give you a boost in performance. Overall, if your main concern is gaming performance, the reality is that there isn’t that big of a difference between single and dual channel memory configurations. There are other reasons to choose dual or quad kits of RAM, though, as outlined above. But, for pure gaming performance, the dual and quad channel configurations seem to offer no significant advantage over single channel configurations. You are basically benchmarking memory performance with GPU intensive tasks. This makes no sense. You should run some memory-specific benchmark application, not random games. These benchmarks make no sense. There’s numerous videos on Youtube that demonstrate EXTREME differences in performance when using 1x16gb or 2×8 DDR4 ram in games. https://www.youtube.com/watch?v=kCg7eVN6N9w for instance. The difference is enormous. Gigantic, I tell thee! I call bullsh*t. You have not specified the IQ settings of the games you ran. On my setup, in PUBG, the significance of Single vs Dual is more than 10%, in Duals favor. Of course in order to rule out GPU bottleneck, you must run this test with very low IQ settings. I would recommend doing the test again with an AMD processor. AMD based systems are more reliant on RAM speeds, so maybe the extra bandwidth will help show the difference. Try switching the graphics settings to low in the games, it will make a hell lot of a difference in the FPS, the difference is not so much in Ultra settings. This is completely contradictory to other benchmarks I have seen with similar hardware configurations. I cannot understand it. Quad channel ram on 8700k ?! 8700k have only TWO memory channel. Well, it looks like you are right. I see that my assumption about four sticks equaling quad channel memory is wrong. I will update it and remove the quad-channel results and make note of the error.